We are glad to unveil Vectorial ®, the second case study within the Best Practice Publication in Circular Design, which includes a fine selection of products, initiatives and projects that will help us to understand the critical role of design to minimise the environmental impact of consumption, reduce the use of resources and rethink the way our societies work. Vectorial is a modular platform for bus stops made with recycled and recyclable PVC that improves the use of space, accessibility and mobility in cities. It was designed and developed by Zicla, a company located in Barcelona. 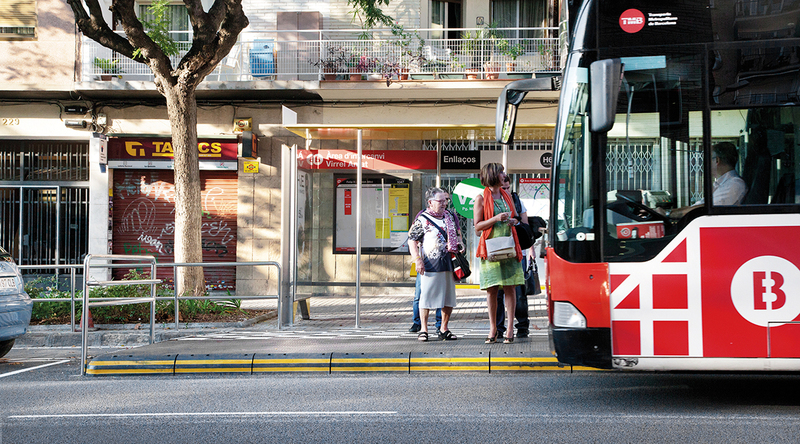 The purpose of the project was to make the bus stops of the metropolitan area of Barcelona more accessible and sustainable in several aspects. This case is a good example of how eco-design strategies can be applied to almost any product to make it competi¬tive in terms of sustainability but also in functionality or price. Vectorial system has achieved an Eco-label which warranties its environmental quality and it’s considered Good Practice by the Design For All Foundation. It also won the Design for Recycling prize given by the Catalan Waste Agency in 2011. As explained in the case study, and taking into account the production system that Zicla created as the final product that results from it, we can say that Vectorial System is a project that both functionally and environmentally far exceeds products that existed in the market at the time of its launch. Last, but not least, Vectorial critically improves access to the bus for people with disabilities with the positive social impact that this entails, and speeds bus stop times, achieving greater efficiency in this important public service. Do you want to learn more about Vectorial? Download the Vectorial case study and learn about the whole design process, materials, challenges, problems and other key issues that led Zicla to turn the Vectorial system into a part of the landscape of Barcelona, as well as of cities of France, Spain, USA, Chile, etc. demonstrating that its modularity, functionality and sustainability makes it perfect for many different urban realities. The Best Practice Publication, led by the design studio Nutcreatives in collaboration with the other partners of the Circular Design project, will be completed with other case studies within sectors like technology, furniture, clothing, lighting or packaging, to demonstrate that circular design strategies can be applied to improve the efficiency of almost every system.